Something that I cannot wrap my head around is why most people in the US season pumpkin or other autumn squash soup with spices like cinnamon and nutmeg. In Japan, pumpkin soup is usually very simple and seasoned only with salt and pepper (but then again pumpkins/kabocha are much sweeter and more flavorful there :p). 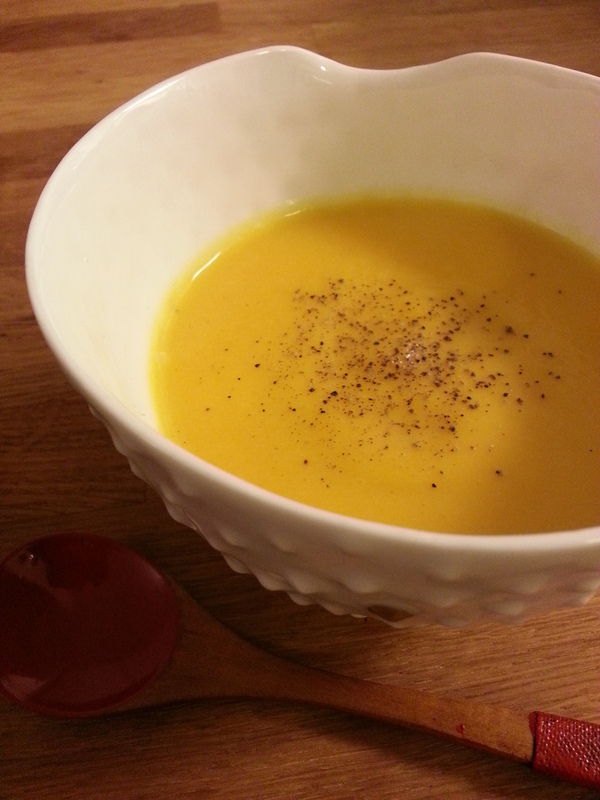 I prefer to keep my pumpkin soup simple as well. This was the first time I ever made squash soup by roasting the squash first. I had leftover butternut squash and kuri kabocha from Lancaster Fresh (from my Quinciple box) so I decided to make a soup with them. Roasting definitely enhanced the sweetness and flavor of the soup. Cut the kuri kabocha in half and coat in olive oil and salt. Bake in the oven until golden brown and completely tender (you should be able to spoon out the flesh). Saute the sliced onions in some olive oil (low heat) until caramelized (this will be easier in a shallow pan or pot but you can do it in a regular pot as well). Add the roasted kuri kabocha to the onions and stir with the butter. Add just enough water (or konbu dashi) to cover the kuri kabocha. Bring to a boil and then reduce to a simmer. Lightly season with salt and simmer for another 10-15 minutes. Pour out a little bit of the liquid just in case (you can add this back if the puree is too thick). Puree with a hand held mixer or in a blender until smooth. Return into a pot and add the heavy cream (add the reserved liquid if still too thick). Bring to a boil and reduce to a simmer. Season to taste with salt and black pepper. When serving, you can add some whipped cream and black pepper.